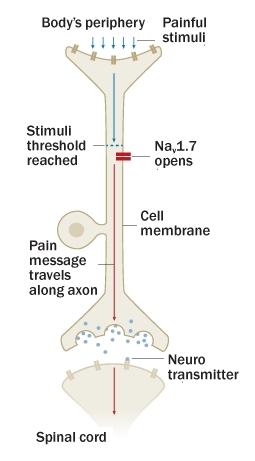 The Science News’ article Hurt Blocker got me thinking about pain and the ways we deal with it. While this research is really about physical pain, the principle applies to all pain. How we deal with discomfort and pain results in numerous unintended consequences. If we knew at what point, in our avoidance of discomfort, we begin shooting ourselves in the foot, perhaps we could manage this more wisely. Typically, pain is protective; it alerts you to impending or actual damage. Nociceptive pain (from the Latin nocere: to hurt or injure) delivers a red alert when you touch something dangerously sharp or hot. 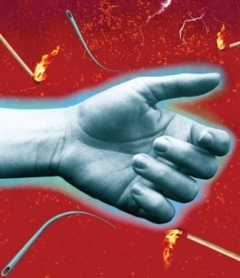 Nerve cells that sense this type of pain have a pretty high threshold, but once activated, the response is instantaneous: Your withdrawal reflex kicks in and you pull your hand away. Inflammatory pain, stimulated by immune system cells, occurs in response to injury. This pain warns you not to move a broken arm, giving the bone time to heal. There’s potential danger that comes with the promise of a superior pain drug. Total pain blockers with few side effects could be abused by athletes or others who want to ignore an injury, allowing them to do even more damage. Such drugs might also quiet warnings of a new and serious condition, such as an intestinal obstruction or a stroke. As with the Pakistani children, living pain-free might even result in severe trauma and early death. Isn’t our unbridled unquestioned quest for “really effective” ways to circumvent discomfort the underlying cause for much of our difficulty? Our instinctive attraction to pleasure drives us to make the living-of-life as comfortable and easy as possible. By itself, that’s not a problem. Pleasure pulls in all living things, just as pain pushes them away. Humans are uniquely able to succeed in achieving results—results to the point of imbalance. Ironically, this loss of balance results in pain, sorrow, and suffering! Do you see how this easily becomes a vicious circle? I find it helpful to put a little discomfort in my daily life, well, actually as much as possible. Whoa! Am I a masochist or something? Nope, I’m a normal pleasure loving, pain hating animal just like most everyone. However, I’ve learned that letting this innate natural instinct dominate my life always backfires. As Buddha pointed out, “pleasures are the bait, the result is pain”. Keeping an understanding of this underlying process is what gives me at least some ‘pseudo free will’ to better manage life. (See, A case for ‘pseudo-free will’ at the end of Free Will: Fact or Wishful Thinking?). knowing the constant is called honest. Not knowing the constant, rash actions lead to ominous results. The way therefore long enduring, nearly rising beyond oneself.